It's that saying that is everywhere. Cliché as it is, it stands to be true. We do not always have to be happy and strong. We, as humans, are allowed to be sad, angry, stressed, anxious and a heap of other emotions. We are allowed to make mistakes and we are allowed to turn around and say; "No." I have just recieved a HND in Acting and Performance. After 8 years of working towards going to a a drama school or performing arts college, after 2 years of hard work in Edinburgh College, I turned around and said, "This isn't for me anymore." Much to my family's dismay. They were probably happy that I am no longer chasing a little girl's dream but they're quick to respond with, "Well if acting isn't what you want to do, then what is?" Which I answer, "I don't know." 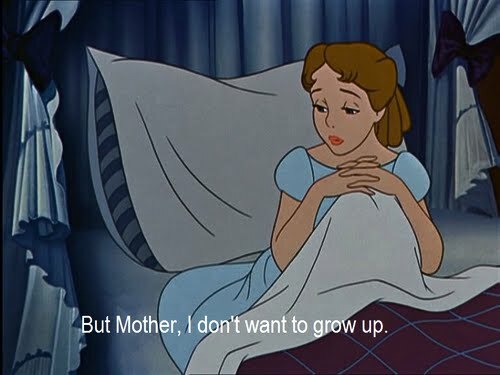 I am back to the question; what do I want to be when I grow up? The plan I have had for 8 years is suddenly gone and I am lost in this big bad world. But you know what? I had the courage to walk away from something that was making me unhappy. It was. Believe it or not, being an actor is stressful. There is so much pressure with it and you need to be a certain type of person to make it in that industry. I'm not really that type. I was fooling myself for a year and a half, trying to convince myself that being an actor was my destiny, but maybe it's not. My heart wasn't in it. It is absolutely fine to walk away. Do not keep doing something if you're not wanting to. You have control of your own life. Everyone changes through the years. I am not the same person I was 8 years ago. I am not the same person I was 2 years ago. Everyone changes. Views change, priorities change and goals change. Am I scared? Yes. I don''t know what I want to do with the rest of my life and I have no idea where to start. I have so many other things going on right now which I need to sort out, I need to do that first. I'm going to be 20 this year and I wont be retired until I'm probably about 70. So I have a while to decide on a career. I just need to relax for the rest of the year and enjoy life. I'm going to try and enjoy every day. Find something to do. Enjoy working, learn more and experience as much as I can with this first year of my life out of education. Just remember this saying: "It will be alright in the end. If it's not alright, it's not the end." That saying at the end is perfect! And you're absolutely right about waking away from something that is not making you happy. You need to love what you are doing if it's going to be your life's work! Good for you for having the courage to step away now. Good luck, and enjoy your freedom! I really love this post and reading things like this. I found your blog on Zoella's site and I'm not sure what made me click though, I'm glad. Its posts like these that really make me feel comfortable and like you're making a connection to your readers, its really great. Be confident in yourself and stay organized, things will work out! Thanks for inspiring me! Saw your link on Zoella's site. I really loved this post, it is something that has been going through my mind for a while now and I didn't really know how to express it. You are only 20 though, and I'm 18 so thankfully we have some time left, if the universe is kind. Thanks for the inspiring post.